Not killed by Israeli drone, as originally claimed. This could become a series. Add two members of the Marxist Popular Front for the Liberation of Palestine to the list. Two Palestinian men were killed in an Israeli military strike on the northern Gaza Strip just after midnight on Sunday, Gaza’s Health Ministry said. The ministry identified the two as Ayman Angar and Mohand Hamouda, both 24. According to reports in the coastal enclave, the airstrike targeted a group of young people who had gathered near a cemetery. The deaths may have resulted from a work accident involving a Palestinian militant cell. The Israeli military questioned the validity of the report, however, and said Hamas blames Israel for incidents it has no connection with. The two Palestinians who died in the Gaza Strip late Sunday night were killed by an accidental explosion and not by Israeli fire, the Gaza Health Ministry said Monday. Sources in Gaza told Haaretz it appeared that a group of young men tried to fire a rocket at Israel and were killed when it exploded. The two Palestinian men were killed in the northern Gaza Strip just after midnight on Sunday, according to the ministry. The ministry identified the two as Ayman Angar and Mohand Hamouda, both 24. In the funeral photos (above), the men are draped in the flag of the Abu Ali Mustafa Brigade, the military wing of the PFLP. Wow, a commie AND a terrorist! I wonder if he dealt drugs to little kids too. I bet that both of them were known for premature eruptions. Ask Bill Ayers or his neighbor Barrack somebody……….. I was just thinking that these two looked just like a couple of ordinary American leftists. For several months, the IDF hid from the public the fact Hamas drones dropped explosives inside an Israeli community on the Gaza border; this could’ve been an experiment indicating on a worrying new capability, which could be used to target Iron Dome batteries and IDF positions. Don’t they have an OSHA for “work accidents”? No, but the US taxpayer is going to subsidize the “workman’s comp” their families will be getting. Oh no! Mohand Hamouda was such a good laptop cover decorator. This seems odd. Once committed to a perfectly good lie, why abandon it? Indeed. They admitted the truth about that baby who supposedly died from tear gas too. I don’t understand it. So? They could very easily have told the relative to shut up. I wonder if the pieces were small enough for the Palestinian Eagle Force (pigeons) to gather up? Wayback in the wayback women used to call guys with this sort of premature explosion problem “short round”. Any way you look at it it’s a massacre and disproportionate and stuff … world community. They need to stand down, form a commission, and investigate their policies and procedures to determine what is wrong with them that is permitting these workplace accidents! the IDF should target all “military parades” held in Gaza, the West Bank and in Lebanon. legitimate military targets deserve a military response. if their enemies are dumb enough to line up out in the open at a given time, such behavior should be rewarded. Totally agree! A few air bursts could wipe out all the virgins in paradise for at least 6 months…but the goats might become nervous. Barbarians. It always amazes me how smart people can defend these evil barbarians and feel superior for doing so. I found this goat’s death disgusting on many new levels, though, given the depravity on display for decades, I’m not sure why. 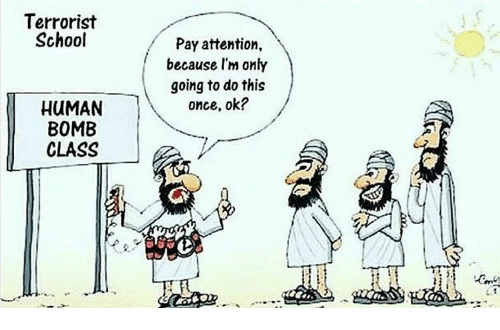 Do they still qualify for the 72 virgins? Goes to show you: not all news is bad news. I love these “Good News” stories…..keep ’em coming! Run them out of virgins! More Dirt Bags bite the dust ,,, Good. If the Diaper Heads spent half the time improving their country instead of making Bombs and Rockets their living conditions would improve. Stupid IS as Stupid Does !! Works for me. Now if we can get some more of their rocket scientist buddies to follow suit. I have friends who are rocket scientists, and to be fair, over there, a rocket scientist is just the guy with a book of matches. I would not be surprised if Mueller somehow investigates this. Might as well since he is looking diligently into everything non Russian Collusion related. Is it wrong to laugh at these stories? Because it takes a lot to make me laugh during my first cup of coffee, but I totally LOL’d. Hate it when that happens. Heh. i hope that the US military is paying attention. i know that we use drones for surveillance. we need to think about outlawing the use of drones in CONUS.